Sealaska Heritage Institute (SHI) this month will open the Walter Soboleff Building to all second-grade students in Juneau as part of a national program to expose children to the arts. The event is part of the Ensuring the Arts for Any Given Child program, which was founded by the Kennedy Center to create equitable access to arts education programs and resources for K-8 students. The Kennedy Center works with 20 sites in the country, and Juneau was selected as the eleventh site in 2013. The arts excursion to the Walter Soboleff Building is scheduled Nov. 17-18. Students will attend a 45-minute session that will include a visit to the Nathan Jackson Gallery and cultural stories told by Mary (Daaljíni) Folletti in Shuká Hít (the clan house). Elementary art specialist Nancy Lehnhart developed an art kit that was used to prepare and teach all second graders in the school district about clan houses and the glass house screen in Shuká Hít made by Tlingit artist Preston Singletary. As part of the lesson, the students make a miniature replica of the screen. 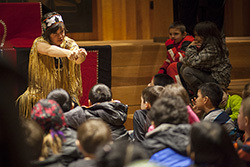 In addition to SHI, local groups supporting this month’s excursion are the Juneau School District, the Juneau Arts and Humanities Council and Behrends Mechanical, Inc.
Sealaska Heritage Institute is a private, nonprofit founded in 1980 to promote cultural diversity and cross-cultural understanding. The institute is governed by a Board of Trustees and guided by a Council of Traditional Scholars and a Native Artist Committee. Its mission is to perpetuate and enhance Tlingit, Haida, and Tsimshian cultures of Southeast Alaska. Caption: Students watch storyteller Lily Hope at the 2015 arts excursion to the Walter Soboleff Building.